The number of families taking road trips this summer is on the rise, according to a survey conducted by AAA earlier this year. 80 percent of families surveyed reported that they planned to hit the road, up 10 percent from last year. I will be joining those ranks soon as I pile my family into a rental car and explore the American West. But what does the typical American road trip look like these days? How is leisure travel changing in America? And how are accommodations responding to these trends? Travelers today seek a more authentic and unique vacation experience. To satisfy this demand, property owners are getting creative with a previously neglected building type: the roadside motel. It was not too long ago that the great American road trip was defined by the wood-paneled station wagon and the classic drive-up motor inn. Motels were at their peak in the post-war years, when long-distance road trips became more popular and car-loving Americans sought simple roadside lodging. In the late 1950s, half of all vacationers stayed in one of the 50,000 motels that dotted the landscape from coast to coast. But the rise of mid-level chain hotels soon pushed the mom-and-pop motels into a period of decline. Americans developed a preference for the familiarity of chain hotels that offered the same, dependable experience from Boise to Buffalo. This pushed the independent motels out of favor, and many of them languished or disappeared altogether. But today, these classic motels are experiencing a remarkable comeback. 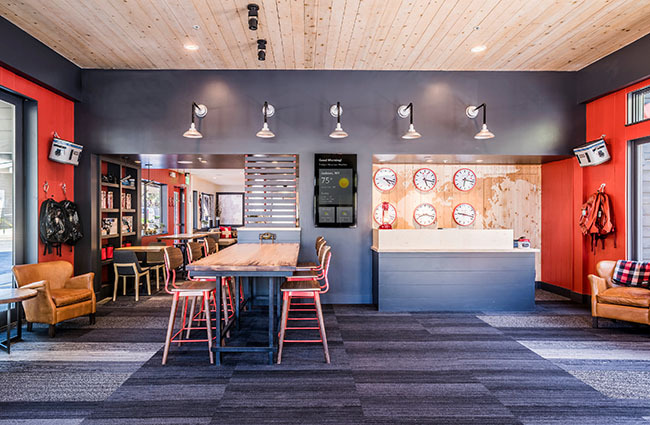 A surge in motel renovations has transformed many forgotten motor-inns into stylish, affordable properties that appeal to the modern adventure traveler. 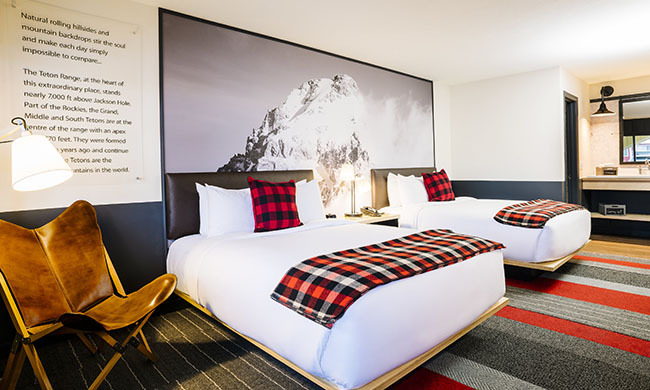 The Mountain Modern Motel is a perfect example of this motel renaissance. 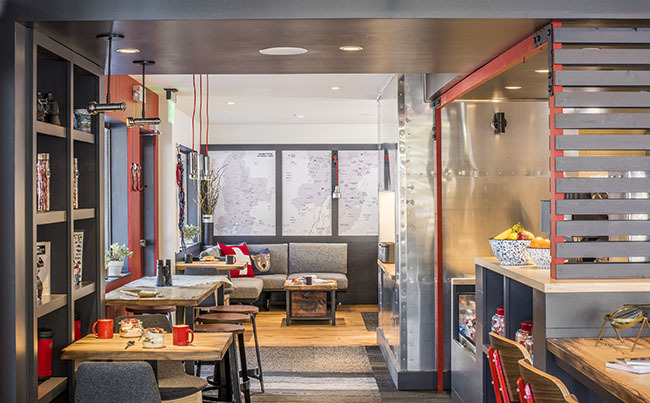 TruexCullins was hired by Crystal Creek Capital to transform a tired property in Jackson, Wyoming into a modern-day “base camp” for today’s road trippers. 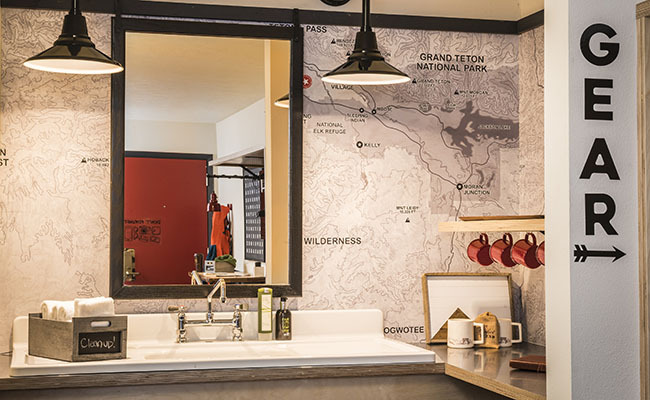 We did this by creating an entirely new guest experience with a distinctly contemporary and functional design, celebrating the surrounding terrain and highlighting the unique culture and spirit of Jackson Hole. The Mountain Modern is located at the crossroads of the Grand Tetons and Gros Ventre Wilderness, and is a short distance from Yellowstone National Park. The amazingly beautiful surroundings were critical to the redesign of the Mountain Modern. The instinctive contemporary design features vibrant elements that establish a true sense of place and appeals to outdoor adventure seekers. Guest rooms are inspired by the tiny-homes movement with an innovative use of space and a highly practical design. Rooms include multi-functional furniture made from durable materials that can be easily cleaned, accommodating the unique needs of Jackson’s adventure-seeking guests. A custom millwork storage wall, made from durable materials such as birch plywood, rubber, and stainless pegboard, is designed to accommodate all types of outdoor gear, from wet coats and boots to skiing or hiking equipment. The existing vanity was transformed into a kitchenette with a vintage-inspired farm sink and a rugged stainless-steel countertop for cleaning backpacks and coolers. The Mountain Modern also provides more shared and communal spaces than a typical motel. An integrated food & beverage lounge area in the lobby provides an opportunity for guests to spend more time outside their rooms. The space includes a breakfast room, café, and a fireplace with lounge seating. To further expand on the modern base-camp concept, every element of décor in the lobby serves a functional purpose. Shelves and walls are populated with outdoor adventure gear that can be rented on a daily basis. The lobby is essentially an adventure gear outfitter for guests. 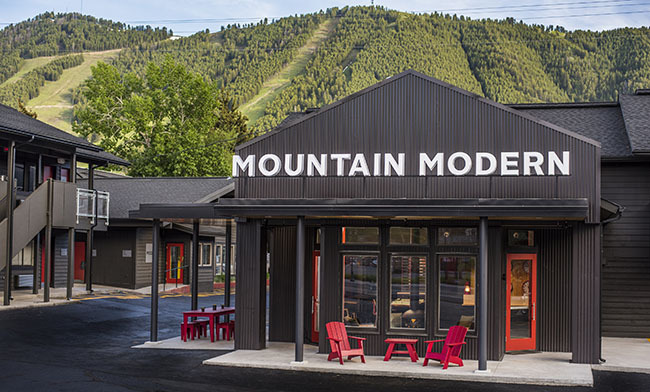 The Mountain Modern is a defining example of a motel revival happening across the country. And we predict you will see more to come, as once-forgotten buildings are given new life to meet the demands of today’s leisure travelers.